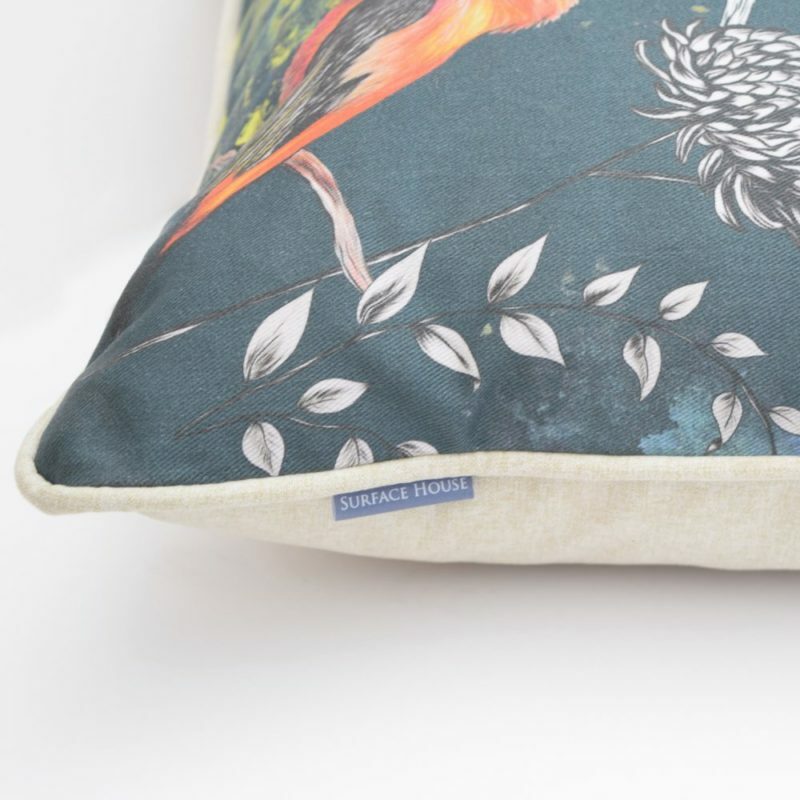 Our Birds & Flowers City Tale print design has been adapted to compliment our collection of luxury handmade cushions. A whimsical and luxury flowers and birds scene. Fine hand drawn imagery is woven together with striking brush work to give a classical feel, lifted by a contemporary edge of colour and bold design style. Indulge your home decor with a unique floral cushion from Surface House. Once we have carefully crafted your cushion, it will be filled with a luxurious duck feather filling, gift wrapped and delivered to you. The handmade Birds Cushion features a unique variation of the original Birds and Flowers Wallpaper design. Exquisitely digitally printed onto a fine 300gsm cotton drill fabric. This fabric is printed in the UK to the highest standard, with an exceptional level of attention to detail. The cushion has a Surface House sewn in label, along the right edge. Concealed zip, running along the bottom edge of the cushion, with reinforced inner fabric. Our Birds cushion 3mm wide piped edges in a co-ordinating cream fabric. The backing of the cushion is a beautifully soft, cream coloured, Clarke & Clarke fabric. This C&C fabric was carefully chosen to compliment the print design details and to reflect the luxurious quality of the handmade cushion. It is also strong and durable. Surface House cushions are carefully constructed in our studio then filled with a heavy, superior quality duck feather filling pad. If you prefer, we can fill the cushion with a hollow fibre alternative instead. Designed, Printed and Made in England, UK. We will carefully gift wrap each cushion, securely package them and dispatch your order within three working days. A tracked and signed for delivery service will ensure that your designer cushion(s) arrive safely to you. We are able to create bespoke variations of this design, so you are able to colour match our soft furnishing collections to compliment your colour scheme. We can also change the scale or shape of the decorative item to suit your interior project. If you would like to create a unique design variation, get in touch via our ‘contact us’ page to discuss your ideas.